The new Manero Flyback in rose gold is the eighth timepiece to join this multifaceted watch collection. Variations include a timeless classic model with a rose gold case and a black, silver, or champagnecolored dial, a robust stainless steel model with a silver-colored or blue gray dial, and a retro style masterpiece with a black dial housed in a stainless steel case. Each of these stunning chronographs embodies the Carl F. Bucherer spirit of Swiss watchmaking excellence from Lucerne. Located in Siberia, Lake Baikal is the largest, deepest, and richest freshwater lake in terms of biodiversity in the world. The annual Baikal Ice Marathon offers competitors from around the globe the opportunity to race across the frozen surface with the goal to help keep the water clean. The title of Hotel of the Year is one of the most coveted in the hotel industry, and is only awarded to the very best hotels in Switzerland. Located at the heart of the famous Swiss spa resort of St. Moritz, the Kulm Hotel St. Moritz boasts breathtaking views of the majestic scenery of Lake St. Moritz, the Engadin Alps, and the hotel’s extensive grounds, which cover 2,000 square meters. 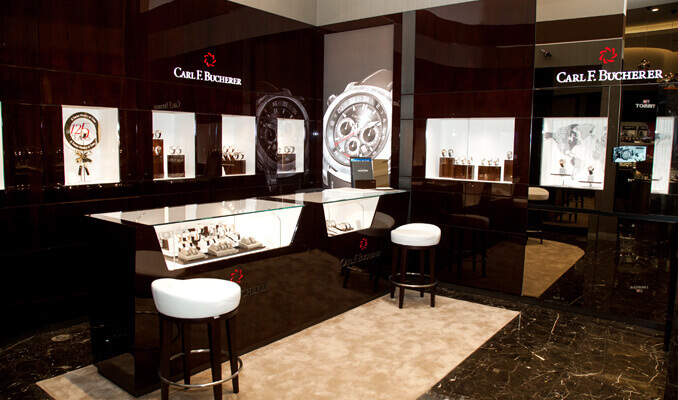 With our latest boutique, we offer visitors a new way to experience the world of Carl F. Bucherer. The interior exudes understated luxury, accentuated by the golden elements of the brand logo, launched in 2016, and the distinctive brand imagery that also reflects the cosmopolitan nature of the city of Lucerne. The new brand identity underlines the company’s ambition to continue growing while raising the profile of Lucerne as a cosmopolitan destination. Last night’s premiere of Atomic Blonde saw the red carpet rolled out at the theater in Potsdamer Platz, Berlin. Among the Hollywood stars in attendance was leading actress Charlize Theron. With David Leitch as director and Swiss actor Daniel Bernhardt as the villain, the latest Hollywood action thriller Atomic Blonde boasts two Carl F. Bucherer brand ambassadors in key roles. Watches from the Lucerne-based brand also play an important role – but you’ll have to watch the movie to find out more details. 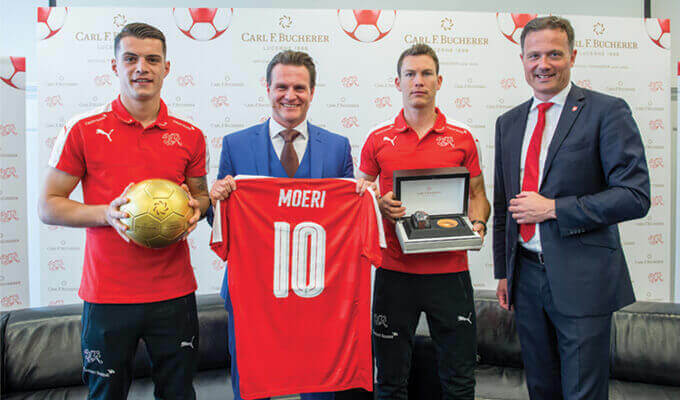 Carl F.
Total commitment, absolute precision, and perfect teamwork are the values that Carl F. Bucherer shares with the Swiss national football teams. The two have worked together as partners since 2016. After an initial visit last fall, Carl F. Bucherer was pleased to welcome the players back to the manufactory in Lengnau. The day’s program brought together some of the top Swiss female athletes from three different fields of sport. Manta rays are one of the many sea creatures whose survival is being threatened by overfishing. 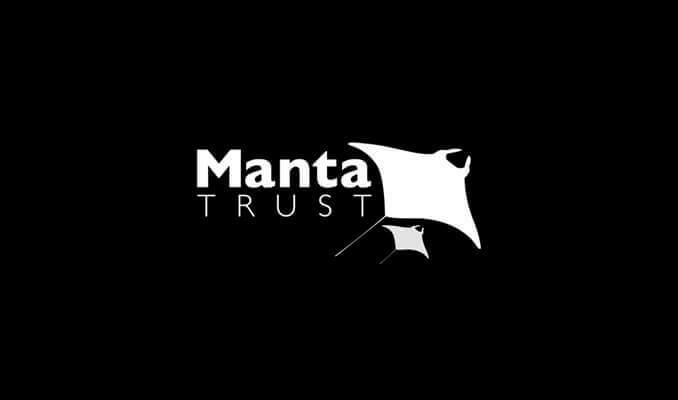 The Manta Trust – a UK registered charity – is committed to protecting and ensuring the survival of these mysterious and charismatic animals in more than 20 different countries. Carl F. Bucherer has supported this charity for many years in order to help with the conservation of manta rays. In the summer of 2017, the Swiss watch manufacturer is launching a limited-edition timepiece dedicated to the charity for the first time. Best performance and ultimate precision are values that are of utmost importance in the world of professional football and in the art of watchmaking. The partnership between Carl F. Bucherer and the Swiss Football Association (SFA) is built on this strong foundation. As the Official Timekeeper for the Swiss National Football Teams, the watch manufacturer Carl F. Bucherer already released a special timepiece in 2016, the Patravi ScubaTec SFA Special Edition. The watch was accompanied the Swiss national football team to the European Championship in France. Carl F. Bucherer has consistently implemented the new brand identity, which was launched at the Baselworld fair in early 2016 with a new advertising campaign. 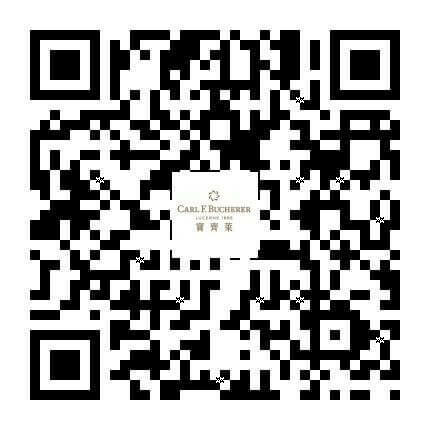 The campaign demonstrates the company’s origins – Made of Lucerne - together with a Digital Lucerne Guide – which Carl F. Bucherer has specially designed. The company has grown steadily over the past five years, quadrupling the number of watches sold from 6’500 to 25’000. Since its invention in the latter years of the 18th century, the tourbillon has represented one of the greatest technical challenges in the art of watchmaking. When Carl F. Bucherer introduced its first produced Tourbillon in 2013, the traditional brand from Lucerne reinforced its watchmaking mastery and reputation for horological excellence. Carl F. Bucherer opens its center of excellence in Lengnau. A modern infrastructure has been established at the company’s manufacture in Lengnau to facilitate optimized production processes and greater verticalization. Thus, an excellent basis was created for developing the company’s own movements and assembling the exclusive watch models that meet the brand’s own high quality standards. In March Carl F. Bucherer teamed up with leading watch publication HODINKEE to offer one watch enthusiast an exclusive chance to experience Baselworld behind the scenes. The #BringMeToBaselworld campaign was the realization of a shared vision between the Swiss luxury watchmaker and HODINKEE to open the world of watchmaking to the fans. 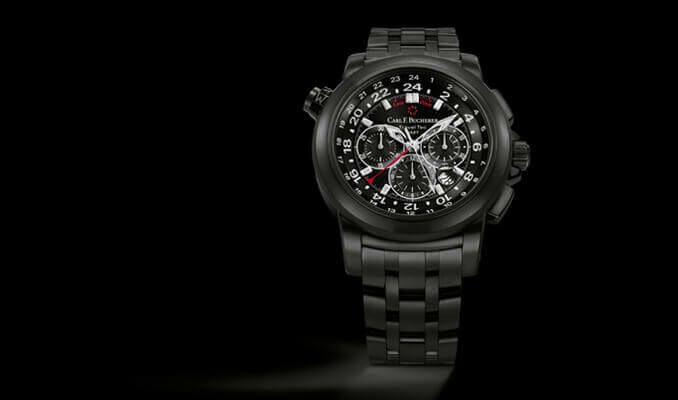 Three time zones combined in one watch made in an exquisite and distinctive material: the Patravi TravelTec by Carl F. Bucherer in deep matt black, new for Baselworld 2016. The robust DLC coating transforms the GMT chronograph into a grand statement on your wrist, designed not to blend in but to impress. New York, October 2015. WatchTime New York, America's Luxury Watch Show, presented their new two-day event experience for lovers of fine timepieces in New York City on October 23rd and 24th. 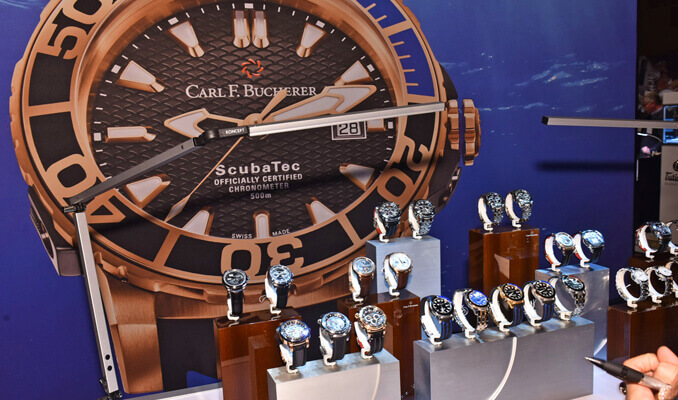 Held at Manhattan’s elegant Gotham Hall, WatchTime New York featured a star-studded lineup of watch brand exhibitors and sponsors, including Carl F. Bucherer. The perfect white summer must-have to wear is the Carl F. Bucherer Patravi ChronoDate. Sportive, yet feminine, with automatic movement, big date, 56 brilliants, delicate round chronograph counters on a mother-of-pearl decorated dial. Multifaceted and individual – the Carl F. Bucherer Pathos collection is a tribute to the fascinating character of every woman. Tune it up with Pathos – show the world your fashion style based on your favourite Pathos model and share it on Instagram ! Win a trip to France’s fashion mecca and enjoy « A perfect day in Paris ». Simply enter by uploading a self-taken photo presenting your favourite Pathos outfit on Instagram, tag @carlfbucherer and make sure to use the hashtag #MyCFBLook. Participate from May 26 to June 22, 2015. 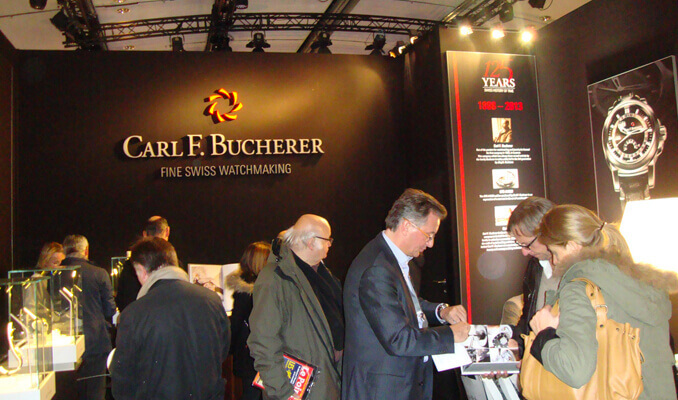 Carl F. Bucherer exhibition at Zurich Airport's Airside Center. 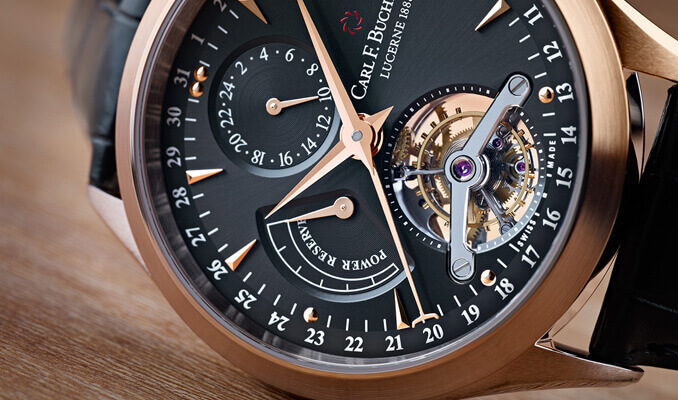 From May 8 to June 21, 2015, the respected Lucerne-based company, Carl F. Bucherer, will offer a fascinating opportunity to experience watchmaking up close. For the tenth anniversary of the Patravi TravelTec line, Carl F. Bucherer unveils an impressive new member of the family: the Patravi TravelTec II. The unique combination of three-time zone display and chronograph now comes in a bold compact case. This model is the ultimate companion for globetrotter and Friend of the Brand Murat Yakin. When travelling, he easily switches timezones with his Patravi TravelTec II. Yet Murat Yakin keeps his homebase Switzerland in sight thanks to the time-zone sun, accentuated as a fine black engraving on the backcase of the Patravi TravelTec II. The traditional Lucerne brand Carl F. Bucherer has created a unique timepiece for "Only Watch 2015": the Manero ChronoPerpetual in white gold. Limited to a single model, this watch is to be auctioned off as the culmination of a global roadshow at the “Only Watch” auction for the benefit of the Monaco Association Against Muscular Dystrophy (AMM). Carl F. Bucherer is participating in "Only Watch", the prestigious auction of exquisite timepieces of select brands for the first time in 2015. The Swiss watch manufacturer Carl F. Bucherer launches its own Tourbillon with an exclusive limited edition of 188 pieces – the Manero Tourbillon limited edition 2015. With a new satin-brushed dial in a velvety brown color especially created for Carl F. Bucherer, the Manero Tourbillon shines in unique splendor – a masterpiece of the watchmaking craft. A timepiece by Swiss watch manufacturer Carl F. Bucherer has captivated the readers of TOP Magazin: The Manero Tourbillon was voted first in the TOP Class category of the readers' choice awards in the 2014 winter issue. The award was officially presented on March 19, 2015 at the watch and jewelry trade fair Baselworld. 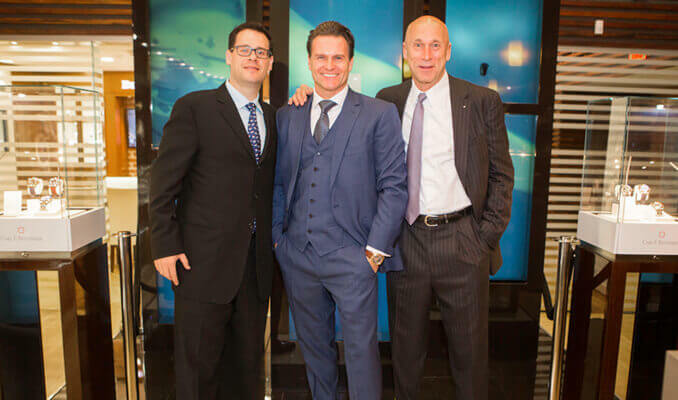 Carl F. Bucherer supports Manta Trust. Swiss watchmaker Carl F. Bucherer supports Manta Trust, a non-profit organization that conducts research to be used to protect the impressive manta ray. 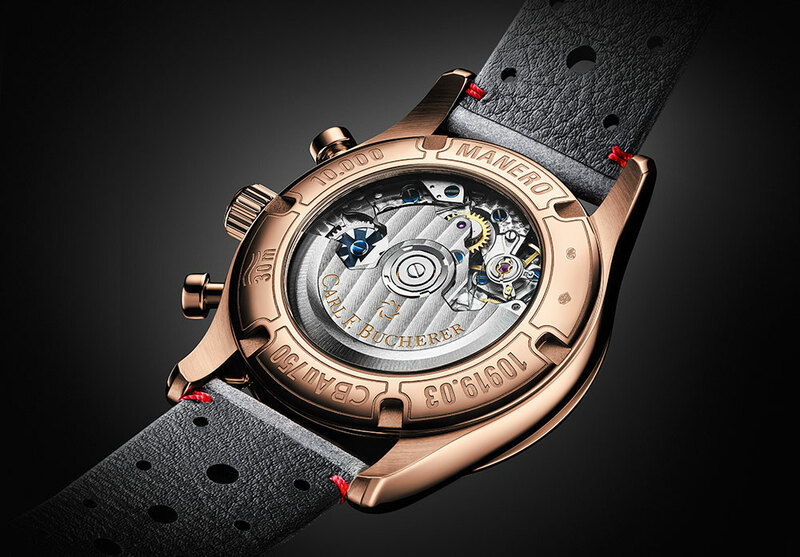 The Swiss company’s commitment to this animal is symbolized by an engraving of two manta rays on the back of the PATRAVI ScubaTec diver’s watch. 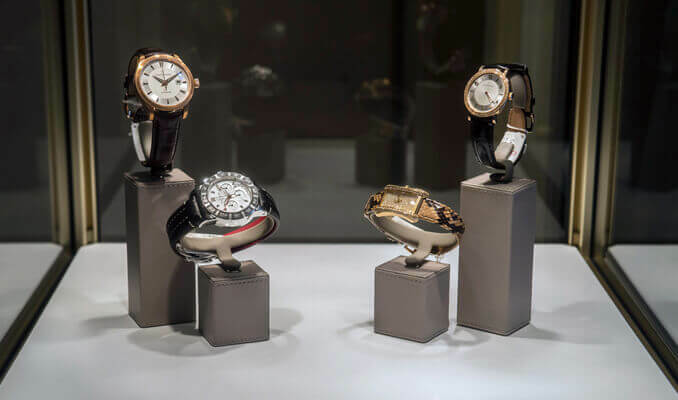 Swiss manufacturer Carl F. Bucherer is introducing a line dedicated exclusively to the ladies: Pathos. Mumbai, November 15, 2014 – Carl F. Bucherer, in association with Watch Time India Magazine, unveiled its newest ladies collection Pathos, with Friends of the Brand actress and model Lisa Haydon and ace photographer Atul Kasbekar. The talented Swiss ski racer Wendy Holdener is the new Friend of the Brand of the Swiss manufacturing brand Carl F. Bucherer. She combines irrepressible enthusiasm with a confident spirit. Model, actress, and presenter Bianca Sissing is the new Friend of the Brand of the Swiss watchmaker Carl F. Bucherer. She perfectly embodies ambitious strength of character and fascinating beauty. David Leitch is Carl F. Bucherer’s new brand ambassador. Lucerne, August 2014. The Swiss Manufacture Carl F. Bucherer has a new friend of the brand in celebrated stunt coordinator David Leitch. With his passion and talent for breathtaking film scenes, he brings visions to life. Creating new spellbinding moments – this is what drives stunt coordinator David Leitch to greater achievements every day. For Carl F. Bucherer’s brand ambassador, apparent obstacles offer the ideal opportunity to put his talents to use and create spectacular scenes. 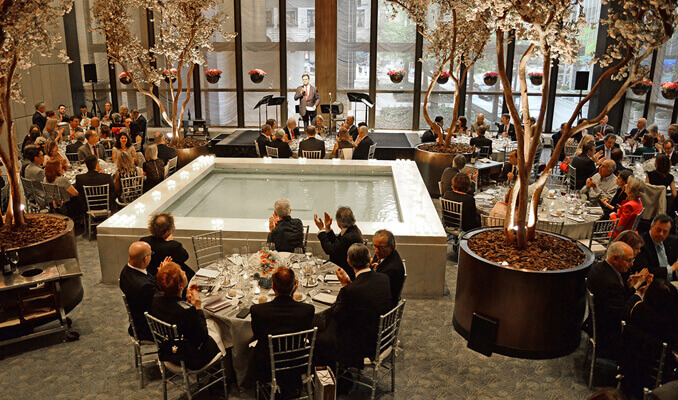 Carl F. Bucherer sponsors the American Friends of LUCERNE FESTIVAL. 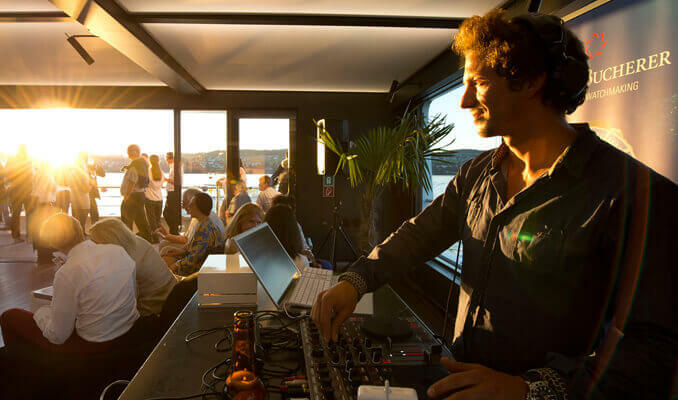 As an international company with roots in Switzerland, it was a natural fit for Carl F. Bucherer to sponsor the American Friends of LUCERNE FESTIVAL, bringing international awareness of this famous Swiss classical music festival abroad. Music brings delight and inspiration. It blends precious tradition with dynamic innovation and artistic talent. Music mirrors the period in which it was composed, past or present, expressing the feelings that move people. 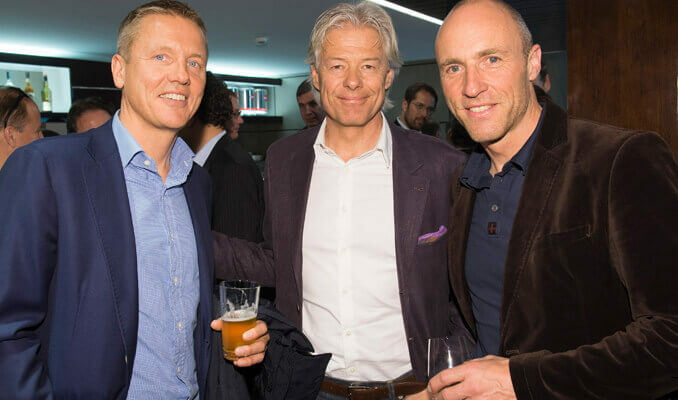 The Lucerne-based watch brand started a new collaboration in Helsinki with renowed retail partner Westerback and invited on this occasion exclusive guests to the store. The CFB Football – Contest! Support the Swiss National Football Team and predict their scores in the preliminary round of the World Cup in Brazil. The prize to win is the Carl F. Bucherer Patravi ScubaTec Special Edition labeled with the logo of the Swiss Football Association (SFV). 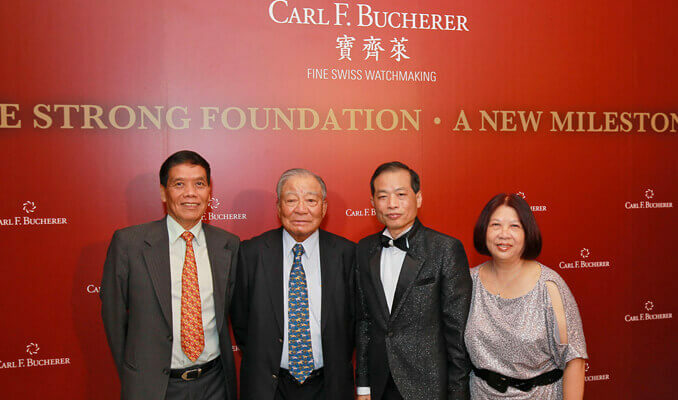 Carl F. Bucherer and zai become partners. Lucerne, March 2014. 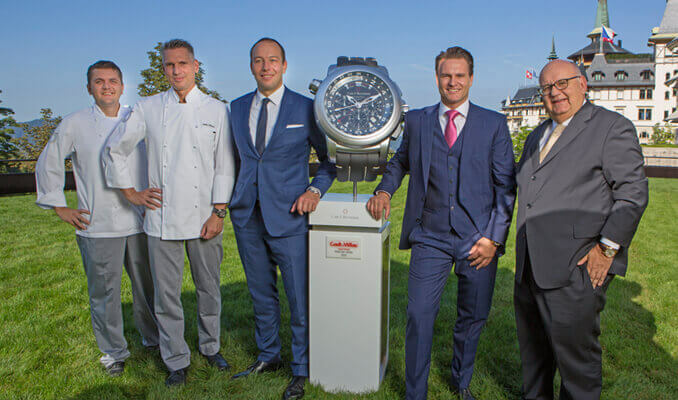 Swiss watchmaker Carl F. Bucherer and ski manufacturer zai start an inspiring partnership. The 31st Hong Kong PGA Championship. The 31st edition of the HKPGA Championship has completed on 15th January 2014. The event was played over 54 holes at the Hong Kong Golf Club and Clearwater Bay Golf & Country Club. The defending champion, Unho Park (Australia) has succeeded to defend his title and win the first place of the Championship. On December 6, 2013 one of the most important award in Beijing - Fashion Power 2013 hosted by the Beijing News was successfully held in National Theatre of China (Beijing). Many celebrities have come to the event, such as Duan Yihong, Zhang Liang, Xu Qing, Ni Ni, Song Jia, Tao Hong, Sha Baoliang and Zhu Zhu. 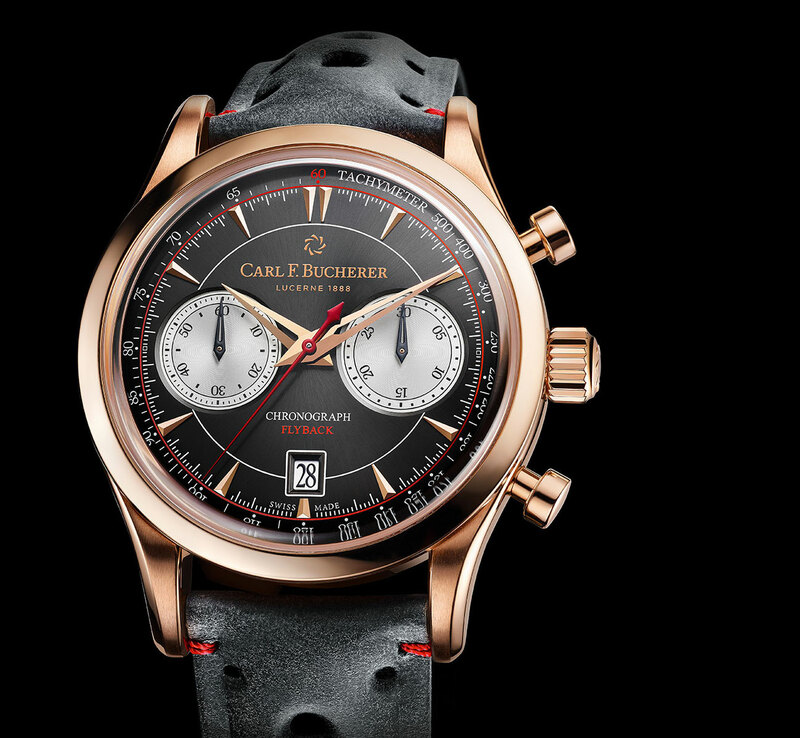 Carl F. Bucherer celebrates its 125th anniversary and introduces the new Manero PowerReserve in style. On December 3, 2013 the Lucerne-based watch brand hosted the anniversary and launch event at the National Concert Hall in Taiwan. The "Salon Belles Montres" is one of the largest luxury watch trade fairs in Europe. The seventh edition of the "Salon Belles Montres" will be held in the famous Carrousel du Louvre from 29th November to 1st December 2013. The “Bal de Crillon” is legendary and almost as rich in history as its stunning venue: the Hotel de Crillon, a palace dating from the 18th century, just a few paces from the Louvre and the Champs-Elysées. In view of its complexity and mechanical sophistication, the tourbillon is regarded as one of the greatest challenges and as the supreme discipline in the art of watchmaking. Now, the Manero Tourbillon created and manufactured in-house by Swiss watch brand Carl F. Bucherer has won the Austrian Chrono Award, underscoring its status as one of the world’s most beautiful watches. With its complexity and its mechanical refinements, the tourbillon is regarded one of the greatest challenges of the watchmaker’s art, and therefore is a supreme discipline. 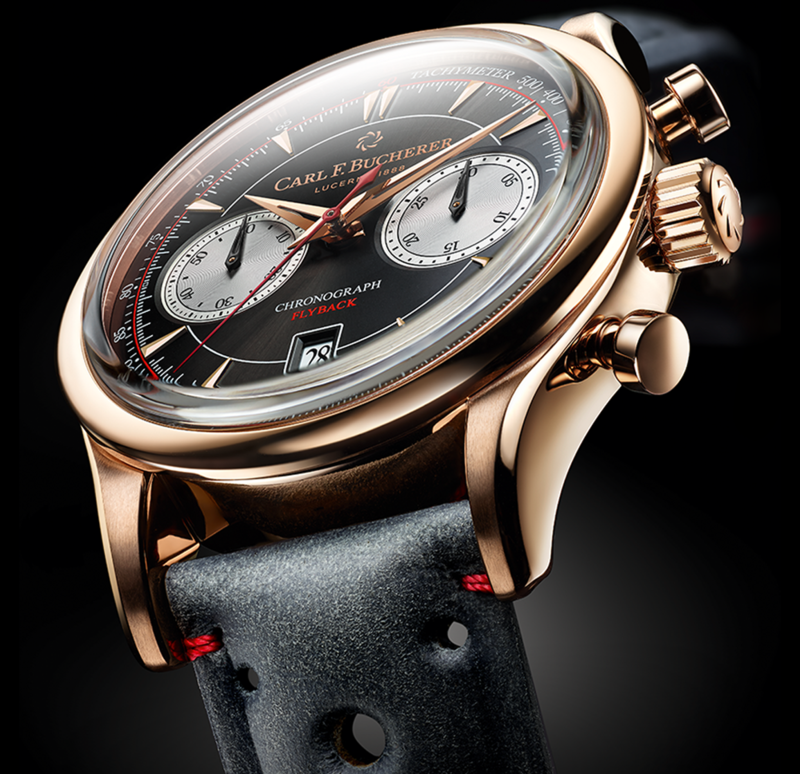 At Baselworld 2013, the Swiss Manufacture brand Carl F. Bucherer presents this complication for the first time in a timepiece from the Manero range, underlining its skilled craftsmanship at the very highest level. Like the bamboo plant, the Alacria Diva Bamboo from Carl F. Bucherer symbolizes strength on the one hand, and grace and pure beauty on the other. This model from the Alacria family has an aura of extraordinary luxury and striking originality.